Many marketers haven’t adopted Instagram because it doesn’t offer the right tools to help them use it effectively. Here are five Instagram tools to help you become more efficient with Instagram. Google Trends show you the volume of searches for “Instagram.” As you can see, over the last year it has grown significantly and is set to grow further in 2014. 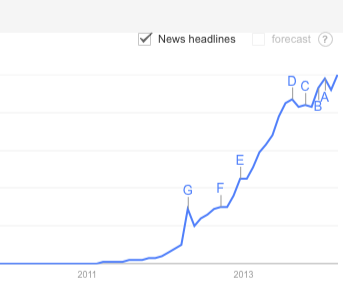 Google Trends show a rapid growth in the search for “Instagram,” which is a good sign for the application’s popularity. Read on to find tools that will help you market yourself or your brand on this popular platform. 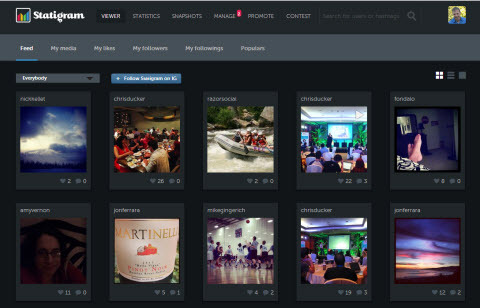 Statigr.am is a web-based management tool for Instagram. In addition to providing detailed analytics, it equips you with a faster and better way of interacting with a lot of content shared on Instagram at the same time. Of course you can use the Instagram web browser, but this tool provides more useful functionality. Viewer—Allows you to view your feed and the people you are connected to in different ways. It makes it easy to navigate through images/videos and like, comment, share or repost them. You can also add or remove new followers. Statistics—View statistics on your own account such as most popular content, growth in followers and how engaging your content is. Snapshots—Collection of images which highlight the statistics on your account so you can share them with your Instagram audience. 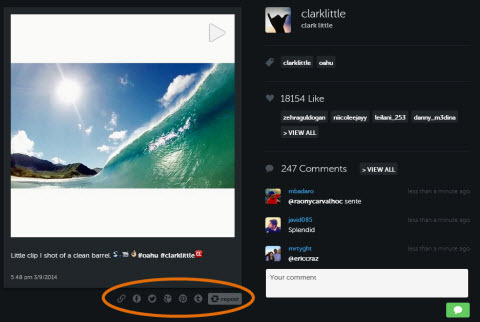 Manage—Interact with the most recent comments you received on your Instagram postings. Promote—Let people who don’t have an Instagram account view all of your photos and comment on them through Facebook (for example, statigr.am/razorsocial). Promote—Provides ways for you to further promote your Instagram photos. For example, you can install an app on Facebook from Statigr.am that will display your images on a separate tab, or create a photo gallery to include on your website/blog. Contests—Paid contest platform for running your competitions on Instagram. To get started, just go to www.Statigr.am and log in using your Instagram username and password. Statigr.am pulls all the details from your Instagram account and presents it to you in a variety of ways. Go to Statigr.am and log in using your Instagram info. Statigr.am functionality is broken down into the following sections that are available through tabs in the application. The viewer is a way of viewing and interacting with your feed. There is a strong community on Instagram and to be involved in this community, you need to be active. You may fall behind on updates being shared on Instagram, so the viewer is a good way of catching up. Rather than viewing one picture at a time on Instagram.com, you can easily scroll through your collection of pictures as thumbnails and immediately interact with them (i.e., comment and like). This is much easier than using the interface on Instagram, enabling you to interact with a lot of pictures in a short amount of time and build up your engagement. You can view many pictures at the same time. This makes it easier to interact with more users over a shorter period of time and find the most interesting pictures. Click on a picture or video to see more details such as who has liked it, all comments and more. You can also share the image on your other social channels or repost it to share with your followers on Instagram. Share a picture on your other social channels or repost it to your followers. Feed—This is a feed of the latest media shared by people whom you follow. My Media—Any media that you’ve shared. You can also organize them into folders. My likes—Photos that you’ve liked. My Followers—Pictures of everyone who follows you. My Followings—Pictures of all of the people you follow. Populars—Pictures that are currently popular that have been shared on Instagram. You can view detailed analytics based on your account to assess its performance. It’s useful to regularly assess how you’re doing. You may not use these analytics on a daily basis, but assessing your performance regularly on Instagram will help it improve. View new followers over the last 7 days. Statigr.am does an analysis of your account and produces a range of media that summarizes your account status (either pictures or videos). Choose the style you like from the library of snapshots and send it your email. You then need to open the email on your mobile so you can save it to your photo library and post the snapshot to Instagram. You may only share this content for fun. I suppose the main reason this functionality is here is to get you to share it on Instagram to help promote Statigr.am. 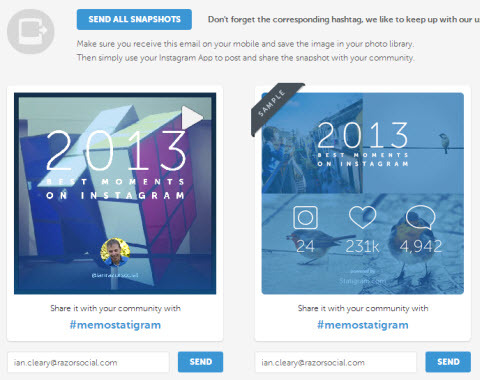 Share your Instagram stats with your community by choosing from a range of snapshot styles. This shows you the last five comments on your account so you can read, delete and/or respond to them. You can also send private messages to other Instagram users. You can provide them with a website address on Statigr.am where they can view your content. 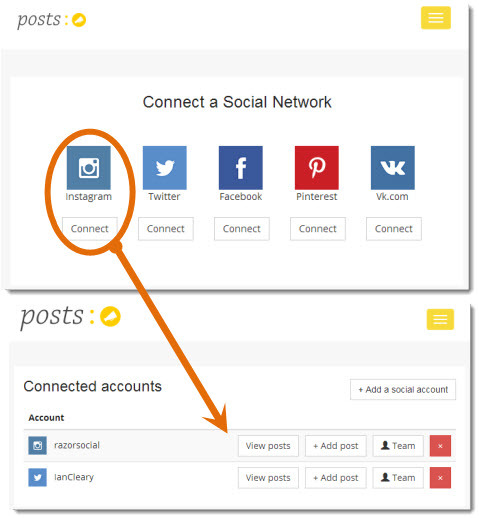 When they interact with your content, they can share it out on Facebook. 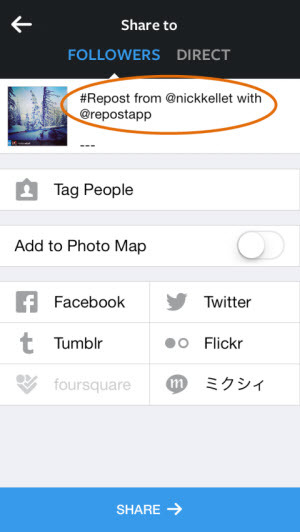 There is an app you can use to add your Instagram content onto your Facebook page. Create a profile cover on Facebook with a selection of your Facebook photos. 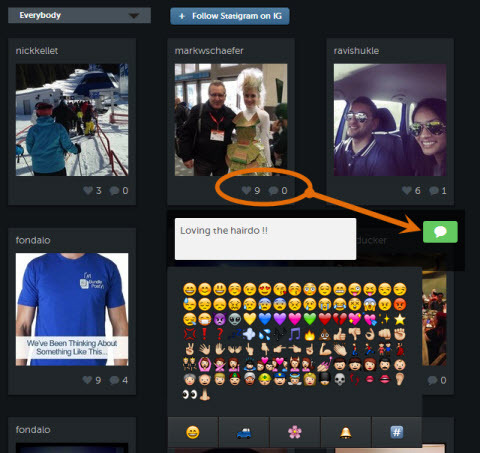 Add badges on your website so people can follow you on Instagram without leaving your website. Add photos in a widget to your website so you can display your best pictures. The Contest tab displays a list of contests that are currently active on Instagram, using the Statigr.am competition functionality. Browse through the library to discover ideas for competitions you could run or even enter a few contests yourself. Click on the thumbnail for a competition to view it fullscreen. When you set up your competition, define one or more hashtags, the country you are targeting and your terms and conditions. People can enter your competition by including the hashtag on Instagram. They can also submit their entry through a public page available through Statigr.am. Plus, you can set up a tab in Facebook with the competition entrants. Your competition is listed in the public directory of contests, which is displayed within Statigr.am. Moderation is available, so you can decide which pictures get displayed and are therefore included in the competition. You can monitor analytics during the competition. When the competition is over, you pick a winner and publish your results on the competition page. 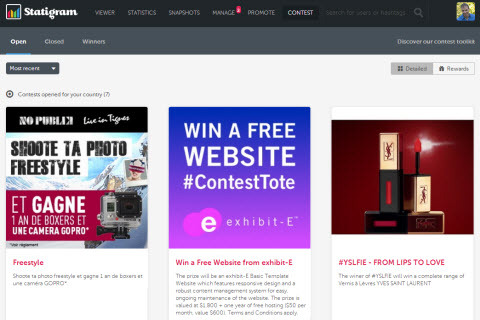 Browse through the library of competitions for inspiration. Statigr.am is a useful tool that helps you analyze and manage your Instagram account from a web-based interface. This will save you time and help grow your community. Competitions can work very well on Instagram, and their functionality for this is straightforward and user-friendly. Repost is a mobile app that allows you to browse through content from your community and repost this content, giving full attribution to the person who posted the picture in the first place. Since Statigr.am is not available on mobile, this is a handy tool to use in combination with Instagram so you can also repost from your Android or iOS device. Note: At the time I wrote this post, there were mixed reviews about the app online, but it looks like some bugs have been fixed because it worked perfectly for me. After you install the Repost app, you can start browsing through pictures. You can like or comment on pictures and also repost. When you see one that you would like to share, you just click on it. 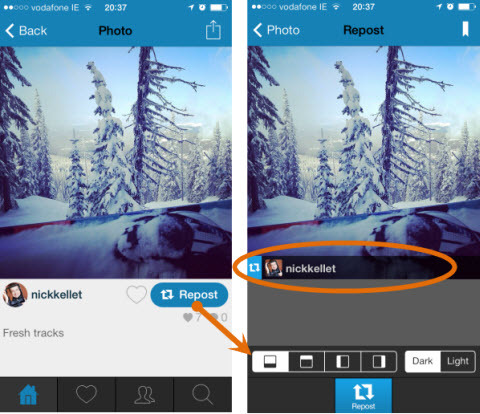 Select the repost option and choose where you want to put the attribution to the original Instagrammer. When you’re finished, select Repost again. This will open the picture (with the attribution) within the Instagram app. Note: you must be logged into the Instagram app on your phone for this to work. At this stage, you just follow the normal process for posting a picture on Instagram. Apply a filter, specify the text you want included with the image, choose on which other social networks you want to share, tag people, and so on. You’ll notice that the attribution to the original sharer is automatically included as part of the text for this share. You may think that there are too many steps involved in this, but give it a go. In reality it’s very easy to repost images. Update details such as the repost text. Think about all of the times you retweet content on Twitter. Why don’t you do this on Instagram? This tool will ensure that you share more of other people’s content so you help build up your community. There is also good attribution displayed by default so everyone knows who shared the original piece of content. In general, you probably just take pictures when you are out and about and share them instantly with Instagram. But what if you want to share a bunch of pictures? Rather than sharing them all at once, it might make more sense to schedule them. Postso provides the functionality to do exactly that. 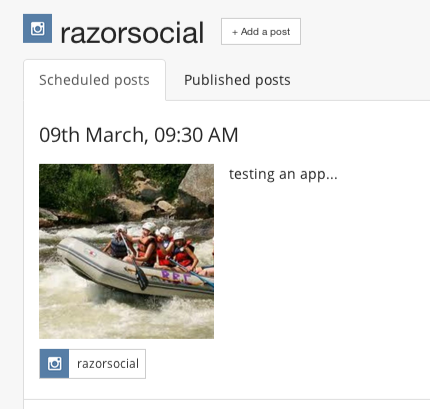 After you sign up, the first thing you need to do is connect your Instagram account with Postso. Select the option to connect with Instagram. When you add your account, you have the option of viewing all of the posts you have scheduled through Postso, adding a new post to the queue or adding a team member to your account. Once your account is ready, select the Add post option. These are the accounts you can connect to Postso. Specify the account—You may want to just send this to your Instagram account, but you can also send it to other accounts you have connected with Postso such as Facebook or Twitter. Upload the picture and text—Upload your picture and enter the appropriate text you want shared. When you upload the picture, there is some limited editing where you can reduce the size of the picture if you want. Name this location—It’s optional to specify a location. 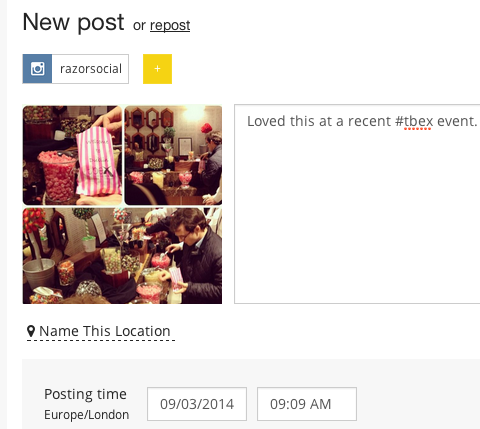 Specify a time to post—Post it immediately or schedule a time in the future. The time is measured in 30-minute intervals. Schedule a post using Postso. Now when you click View Posts from the list of connected accounts, you should see the post you have just scheduled. You can also view the posts that have already been published by Postso. This is the queue with currently one post scheduled to go out. While Postso doesn’t include a lot of functionality, the scheduling functionality is still very useful to have. I know that when I have a series of tips on social media tools, I don’t want to share them out on the same day so scheduling them makes it much easier. Justunfollow provides an easy way to manage your followers on Instagram. It’s a web-based application that helps grow your followers, while identifying users who aren’t engaging with you. Use this tool to clean out the list of people you follow, and focus more on the ones more relevant to your business. See if you are following people who aren’t relevant to your business, and unfollow them. While some of what Justunfollow provides overlaps with Instagram’s standard functionality, it has some additional uses that aren’t available in Instagram. When you connect your Instagram account with Justunfollow, there are various options that you can perform on the account. Non-followers—View a list of people you follow who don’t follow you back. If you find that these users are not relevant to your business, you can just unfollow them. If they’re people whom you recently followed and/or they have great content, you might want to keep following them for a while. Fans—These are people who follow you, but you don’t follow back. 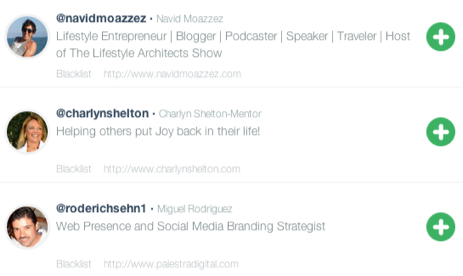 It’s useful to go through this list every so often and follow the people who are relevant to your business. The green plus icon allows you to follow them with just one click. Who unfollowed me—Once you connect your account, Justunfollow will start tracking accounts that unfollowed you. If you notice that a lot of people are unfollowing you after you share particular content, you may have to reconsider the content you share. Who followed me—This displays any recent new followers you get. Copy followers—With this functionality you can enter the Instagram username of someone who is relevant to your business. You can then copy them to a list and start following some of them. Whitelist/Blacklist—You can highlight accounts and specifically mark which accounts are good (whitelist) or shouldn’t be shown in the future (blacklist). Friendcheck—This is a search facility where you can look up an Instagram account to see if that person follows you. Quickly follow or unfollow people on Justunfollow. 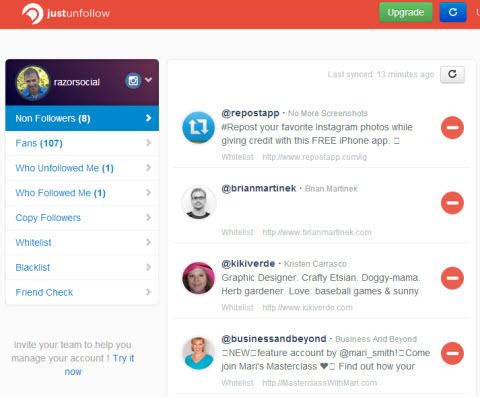 Justunfollow is a useful tool for tidying up your followers. You can remove or add followers, or just monitor your follower list. 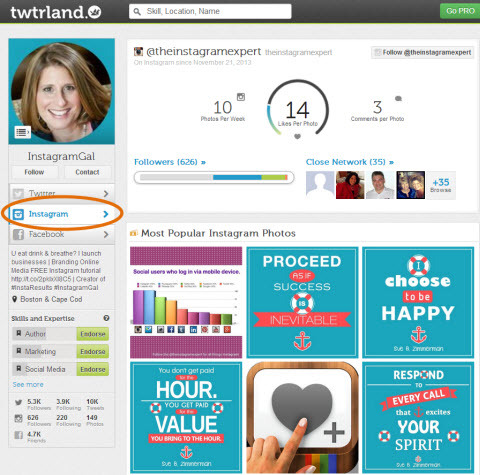 Twtrland started off as a Twitter analytics tool, but recently added Instagram and Facebook. The Instagram functionality allows you to analyze your competitors’ accounts on Instagram. Search for a competitor based on skill, location or name. From the resulting list, pick out the account you want to analyze and open up their profile. You’ll have the option of viewing their Twitter or Instagram details. 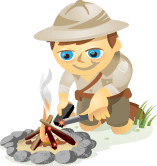 Enter a skill, location or just keywords to find a competitor’s account. In the example below, I searched for Sue Zimmerman, who is an Instagram expert. I was curious to see what her profile is like and what works for her. View full details of a competitor’s profile, including the pictures with the best engagement. Overall analytics—This displays the overall statistics for this account. Is your competitor posting more frequently than you? Are they getting more engagement? It’s worth analyzing several accounts to see how they compare to yours. Photos posted—You’ll see a list of photos posted according to how popular they were. You get to see what photos do and don’t work for your competitors. Your competitor’s network—View this Instagrammer’s connections. You can display their followers according to how much they interacted with your competitor’s posts (i.e., number of likes and comments) or by who has the most followers. 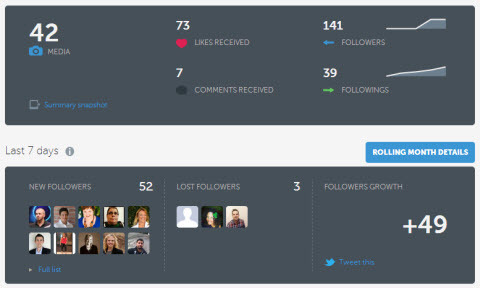 View analytics—When you see someone of interest, you can click on their profile and view analytics on their account. You can also follow them on Instagram. If you want to do further searches, you can add more filters. For example, you can decide to view only people who are relevant to a topic or are from a certain country. This is a great way to build your network on Instagram—identify your competitors and follow people they interact with who have a good following themselves. Twtrland provides you with some useful tools for competitive analysis to identify what content does and doesn’t work, to whom you should connect and more. We have seen Instagram grow rapidly over the last year and it looks like that will continue. These tools will help you grow a strong presence on Instagram, and they are all well worth considering. What do you think? Are there any tools you like we haven’t mentioned? What are your thoughts? We would love to hear from you. Share your favorite Instagram tools in the comments.